“New Republic Get an Owner Steeped in New Media” (NYT, 3/9/11) ran the story in the Media Decoder blog of the Times. Apparently The New Republic, the venerable publication that could be reached by taking a slight right turn at The Nation and a sharp left at The New Criterion will survive the social media revolution after all. 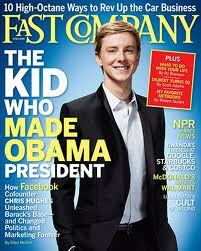 The Times story recounted how The New Republic had been looking for a suitor and found a perfect match in Chris Hughes, one time roommate of Mark Zuckerberg at Harvard, who had been one of the founders of Facebook, before he went off to devote his energies to the Obama campaign and other philanthropic pursuits. “The influence of The New Republic has often outstripped its small staff and its small circulation (around 50,000),” the Times commented. “Founded in 1914 by the political journalist Walter Lippmann, it has long been a part of the liberal movement, counting presidents as readers, including John F. Kennedy, and luminaries as writers, including George Orwell, Virginia Woolf and Philip Roth.” Hughes' idea is simple, as reported by the Times. The long form of journalism which is The New Republic's credo should find it’s home on the tablet. Naturally, The New Republic is not the only magazine that specializes in in depth and original reporting and criticism. The New Yorker is naturally the epitome of this kind of publication, but it already has a highly developed digital presence. In addition The New Republic is really a link to the old style broadsheets of the past (many of them like The New Leader and I.F. Stone’s Weekly now defunct) which were the stomping ground for the great maverick intellects of their day. In a world which values style over substance, the medium over the message, Hughes acquisition is significant in that it again values and guarantees to bring to a vastly larger audience a certain level of erudition. Many publications are acquired by moguls with huge cash troves. The Daily News and The New York Observer are respectively owned by Mort Zuckerman and Jared Kushner whose wealth derives from real estate, but Gregor Mendel couldn't have picked a more potent cross-breed in The New Republic's new buyer. The fact that Hughes wealth come not just from media, but from social networking is huge.